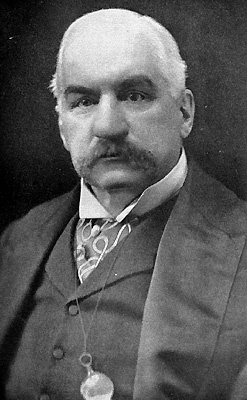 Executive summary: Railroad financier, J. P. Morgan & Co.
J. Pierpont Morgan's grandfather, Joseph Morgan, was a founder of Aetna's parent company, and his father, Junius Spencer Morgan, was a banker and business partner of George Peabody. Young Pierpont was educated in Europe, and his first job, arranged by his father, was with the New York banking firm of Duncan, Sherman, & Company, where Morgan later bragged that he had used the bank's money to arrange a lucrative deal for himself, speculating in coffee beans. He was 24 years old when he established his own private wholesale bank that underwrote assorted business ventures. He purchased an exemption to avoid military service in the American Civil War, and when Peabody, his father's business partner, retired, Morgan became a partner in the firm, J. S. Morgan and Company. In 1871, in a merger arranged by his father, Morgan's company absorbed Drexel & Co., and became Drexel, Morgan & Co., a forerunner of Drexel Burnham Lambert. Morgan made millions from the death of railroad baron Cornelius Vanderbilt, when William Henry Vanderbilt, son of the deceased, hired Drexel, Morgan & Co. to sell off his inheritance, and Morgan maneuvered to have himself named as one of the directors of Vanderbilt's fortune. In 1881, Morgan's house became the world's first electrified residence, when Thomas Edison wired the structure with incandescent lights and installed a steam engine and dynamo in the back yard to provide power. The following year, Edison wired Morgan's office building, and for years Morgan was the primary investor in Edison's projects. In 1892, Morgan arranged the merger of Edison General Electric Company with the Thompson-Houston Company as General Electric, which, with competition again eliminated, became wildly profitable. In 1885, Morgan brokered a trust between two rival railroad firms, the Pennsylvania Railroad and New York Central, ending their rate wars, and he financed or re-financed other competitors, including the Baltimore & Ohio, the Chesapeake & Ohio, the Great Northern Railroad, Northern Pacific Railroad, Reading Railroad, and the Southern Railroad. With Morgan's control of the boards of all these companies, competition was very friendly and profits very large. In 1895, years before the establishment of the Federal Reserve, Morgan provided $62M in gold to back American currency, effectively rescuing the US dollar from collapse, in a transaction he described as his proudest accomplishment. In the same year, he reorganized and consolidated several of his and his father's businesses as J. P. Morgan & Co.. In 1901, Morgan began orchestrating the mergers that led to the formation of US Steel, and in 1902 he brought two competing farm equipment companies together as International Harvester. After cornering the market with secretive purchases of Northern Pacific stock that left many Wall Street financiers insolvent, he established the Northern Securities Company as a holding company for his several railroad firms, but Northern Securities became the first company brought down by President Theodore Roosevelt's enforcement of the Sherman Anti-Trust Act. In the financial panic of 1907, however, Morgan made millions more with the purchase of Moore & Schley, a brokerage house deemed too big to be allowed to fail. Morgan, though, only rescued that firm after receiving assurances from Roosevelt that there would be no anti-trust objections, and the purchase gave Morgan even greater control of the railroad industry. His last few years were complicated by a Congressional investigation into his business practices, including his effective control of interlocking boards of directors across hundreds of businesses. His personal life was also out of the ordinary. By all accounts he was deeply in love with Amelia "Mimi" Sturges, but they knew when they married that she was dying of tuberculosis, and she passed away mere months after their wedding. He later married Frances Louisa Tracy, daughter of a well-connected lawyer, and she bore him four children. Their marriage effectively crumbled after several years, and Morgan was not discreet about his many affairs, but they never divorced. He died while on an ocean cruise, en route to Egypt.